This interview is week 6 of Sean Claes' 52 Weeks of Austin Music Interviews. 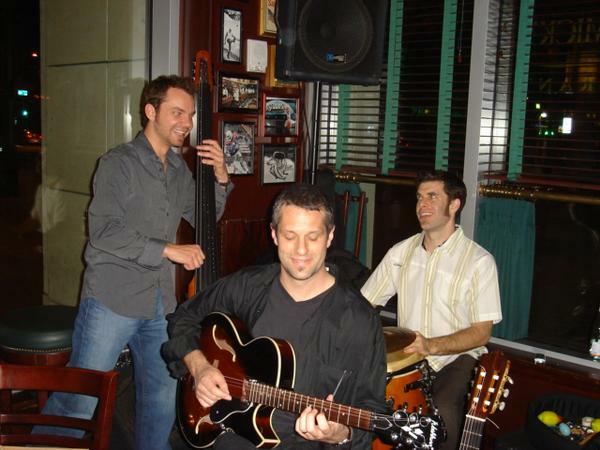 Over a decade ago, guitarist Kurt David Phillips and bassist Mike Rosch got together in Austin, Texas and decided they would make beautiful music together. 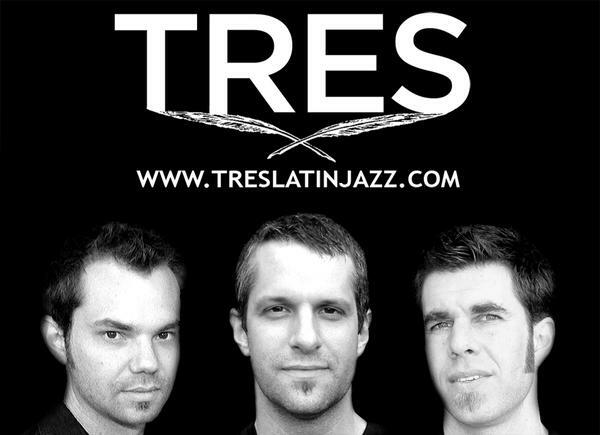 They combined their passion for Latin music and decided to perform their brand of Latin Jazz fusion together with a percussionist and bill themselves as TRES. In 2005 they released their debut album, a self-titled instrumental offering that is both great and timeless. Most of the gigs they play seem to be as background music at restaurants, so if you’ve eaten at places like Z Tejas (they play the 6th Street location this Sunday 2/19/12), there’s a chance that the background music was performed by these amazing musicians. First, some background on these individuals. 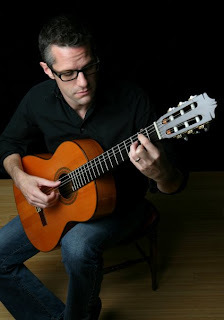 Rosch plays in six other bands in town (Blind Date, Sonido Sol, Carousel, with Britini Hoover, the Richard Jessee Project, and with Omar Lopez) . he also owns Mary Tubble, LLC which does composition and recording of music beds and sound effects for commercials, indie films, internet videos and more. Phillips has been playing music well over 20 years and is the owner of the Lone Star School of Music, a local music school that offers individual lessons as well as rock camps, mommy and me, and more. In 2005, the band parted ways with their percussionist, Shango Dely, when he had to leave the country, and Noah Mosgofian joined the group. Mosgofian has just settled to Austin after touring with the amazing dance troupe STOMP for six years. Like Rosch, he plays with several outfits. I thought the week of Valentine’s Day would be a good time to touch base and talk with the members of TRES. After all…Latin infused jazz IS sheet-dancing music… isn’t it? Sean Claes: TRES seems to fit the band for two reasons, the fact that there are three in the band plus the Latin jazz music you play. How did the band end up choosing this genre of music? Mike Rosch: Haha, yeah the name was decided based on those two things and at the time, none of the three of us felt like the name was as important as the music. Plenty of bands have weird or silly names. It does make it difficult for us to add a sax player or do duet gigs, however. The style of music was the reason we got together, really. I was recruited into my college’s salsa band and realized in a hurry that this was my absolute favorite style of music I had heard. 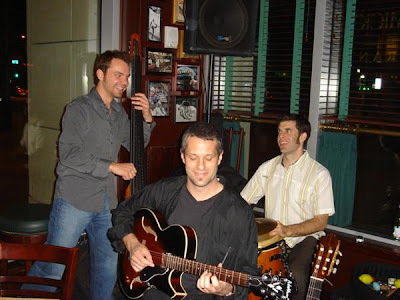 When I decided to get back into playing, I wanted to play “salsa” but in a smaller format – or at least as close to real “salsa” as three guys with no horns could sound. Kurt had wanted to do a Latin trio from the get go too, so between my salsa knowledge and his collection of guitar based Latin music, our sound was born, I suppose. Claes: How have you and Kurt kept it together as a band for a decade? Rosch: It’s no easy feat. But then, sometimes it’s totally effortless. I guess it’s not that different from a good marriage. You realize your partner has quirks, just as everyone does, and you can either deal with them, or not. It always makes me sad when a band can’t get along, so I’m fortunate and very happy to say that the three of us do. Kurt and I have been like minded enough to keep this going for 10 years, as you mention, and with the addition of Noah a few years back, I think we found a 3rd guy who thinks like we do. And don’t get me wrong, all 3 of us have quirks and occasionally get our feathers ruffled, but we are close enough with each other to realize that at the end of the day it’s about the music first, and we can fight later. Usually later never comes. Claes: You released your self-titled debut in 2005 containing 13 original songs. The cool thing about your music style is, it’s instantly classic and timeless at the same moment. Do you have plans for a follow up CD? Rosch: That is a very nice compliment, thank you. I’m always glad to know that the current CD is resonating with people. There are definitely plans for a new one. We’ve done quite a bit of scratch tracking for it already and so far it’s just been a question of scheduling to actually get it done. The new disc will be our own versions of really old Cuban songs, really more of the idea I mentioned earlier about arranging “salsa” into a 3 piece band. We’ve added vocals since the first CD, and might even add some horns and such to the new one. It’ll be hot, if we can ever get it done. Claes: When you release a new recording, are you going to release is via a CD or as a digital download? Rosch: It is my opinion that in a world of iPods, mp3 players, and digital downloads that people still do listen to CDs and like to have them in their hands. Since we primarily sell our music at shows, it’s a whole lot cooler to have a physical disc than a card with an iTunes url. It will be available in both formats, of course... I’m just saying, CDs are not dead. Claes: On the CD, you’ve got a track entitled "The Last Picture Show (a Theme from an Imaginary Western)" That really has that Desperado feel to it. Was that in your mind when writing it? Kurt David Phillips: The inspiration for “The Last Picture Show” goes a little further back, all the way to The Good, the Bad and the Ugly. Ennio Morricone, who wrote the soundtrack, has always been one of my favorite composers and has been copied by almost everyone, including myself. The Desperado influence is on the right track, just envision Clint Eastwood instead of Antonio Banderas strolling into town. Claes: When you play live, do you tend to favor originals over covers? Rosch: Absolutely not. We still play plenty of our own stuff, but we have way too much fun playing our favorite songs from other composers. That said, when you come to a TRES show, you don’t have to know some obscure Benny Moré song to enjoy the show, nor do you even have to be familiar with our CD. That’s what I love about this music – it’s just pleasing to hear and fun to dance to, even if you’ve never before heard one note of what we are playing. Claes: You’re playing Sunday February 19th at Z Tejas on 6th Street. What can the crowd expect? Rosch: Great drinks, half price appetizers, and lots of pretty people. Haha. Z Tejas is a restaurant gig that we currently do once a month. 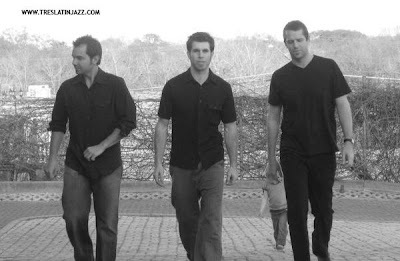 As a Latin jazz trio we actually do more restaurants than anything else, and in these cases we are just trying to provide an exciting added bonus to an otherwise already enjoyable dining experience, without making it too much about us. We do play in the “annex” at Z which is more of a bar but still serves the full menu, so I highly recommend to anyone looking for a fun night and a great Austin experience to come on out. And again, we are there once a month playing all varieties of Latin music. 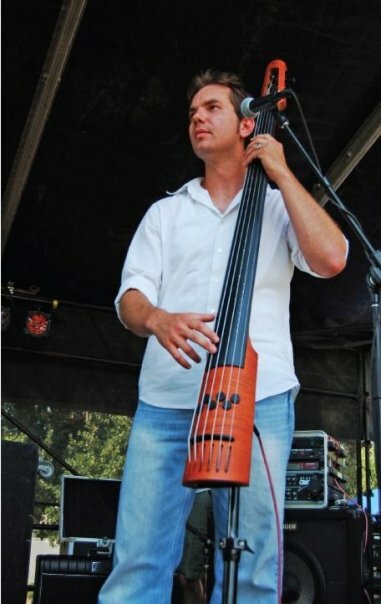 Claes: When playing a restaurant gig like Z Tejas, what is the #1 requested song that people ask you to play? 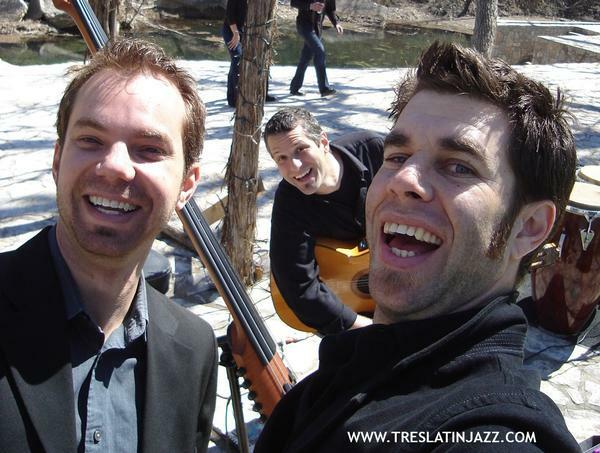 Rosch: In TRES, we have a joke... We take requests as long as it’s a Latin jazz song that we know. The thing is, people love what they hear, but they don’t really know the music. So rather than specific requests, we typically get requests for a particular artist that they might have thought of while listening to us. “Do you guys know any Santana,” for example. Santana’s music isn’t really what we do, but we learned one of his just for this kind of occasion. Other than Santana, we get Gypsy Kings and Buena Vista Social Club requests, and once in a while a patron who just doesn’t get it will request “Sexual Healing” or “Smells Like Teen Spirit.” True story. Claes: Do you have a favorite gig that you’ve played in the last 10 years? Rosch: It’s really hard to think of just one in the last 10 years, but for me I’d say it was our CD release party. We held it at an amazing place called Tambaleo which is closed now, and had just an amazing turnout. This was before we had even met Noah, and the percussionist who recorded the CD had to go back to his home in Columbia and couldn’t do the event with us. It was of course bad timing and a real bummer, but we turned lemons into lemonade and hired BOTH of our favorite substitute percussionists, one on congas, the other on drumset. It was big and loud and full and tight and I just soaked it up. Oh, and we sold a ton of CDs which is always nice. There was also a road show - an event in San Angelo, TX that turned out to be a great gig with an amazing after party. But what happens in San Angelo, stays in San Angelo. Haha. Claes: You are all very competent and amazing musicians, and this style is not an easy one to emulate. Do you feel the genre gets the respect it deserves in Austin? 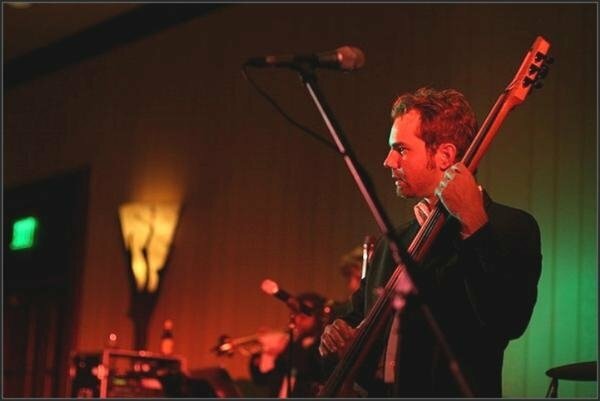 Noah Mosgofian: Jazz in general doesn't get much respect in Austin. There's only one dedicated Jazz room, and it's often empty. I think people appreciate it, they just don't go out to pay to see it. Rosch: I don’t want to step on any toes in this town, but he’s not wrong. In general, all the jazzers in town are competing to play at the same 5 restaurants. I’m exaggerating a little, but it’s unfortunate that more places don’t want it. Or the ones that do, don’t have the budget. So I guess in general the answer is no. But I would take the time to thank Elephant Room and BBA Management and Booking. Elephant for sticking to their jazz club guns, and BBA for keeping the jazzers in this town working. Claes: Mike, you did a bass-only recording of Steve Vai’s “The Attitude Song” that actually garnered a response from Vai himself. How’d he end up hearing it, and what did he say? Rosch: That’s a silly story. I recorded that totally on a whim and later added it to a demo of mine. I don’t know why I thought anyone would want to hear an all bass version of a “shred” guitar tune, least of all the man himself who wrote and tracked the original, but I somehow got it in his hands and he liked it. This would have been before MySpace, Facebook, or any of that, so I must have just found somebody’s email address on his website and convinced them to put it on his desk. I got an email back from him a week later. He basically told me that he was very impressed, but equally amused, indicating that he laughed a lot while listening to it (I guess that’s a good thing? ), and he praised me for the dedication it took to make it happen. It felt pretty good. Now if I could just do one gig with Vai before I die, I’ll be complete. 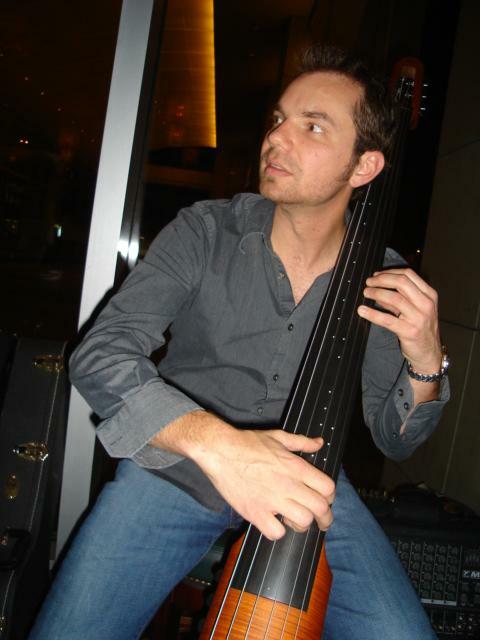 Claes: You have been called “Jaco Reincarnated” by your peers. For those who aren’t familiar with Jaco Pastorius, can you explain? Rosch: This is a tough question. On the one hand, it’s silly again for me to be compared to him, but there’s nothing silly about Jaco’s story. To the contrary, rather tragic. Jaco was possibly the greatest bass player that ever lived. If he were still alive today, who knows what he’d be doing? He was so innovative. Unfortunately, he was very self-destructive and between drugs and a very real death wish, he ruined his life and burned a lot of bridges before being beaten to death by a club bouncer. He was likely bipolar but never officially diagnosed. I think the parallel between he and I was drawn only due to the fact that I used to play fretless bass almost exclusively (as did Jaco) and have a tendency to play more “melodic” bass lines with harmonics and such, rather than just basic ones, centered around roots and 5ths – also very Jaco-ish. I encourage every living person, musician or not, to at least check out the wiki entry on Jaco. It’s an amazing story, albeit a sad one. Claes: Noah, you did a 6-year tour playing percussion for STOMP. 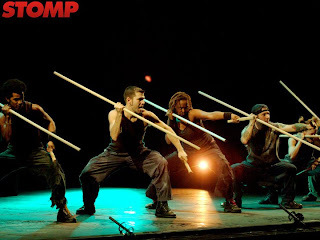 I saw Stomp when it came through Austin a handful of years ago and it blew me away. What was it like and why did you step away from it? Mosgofian: So far STOMP has been the highlight of my musical career, and the backdrop for some of most memorable experiences of my life. Because we would tour non-stop, the show becomes your life. The cast and crew become your circle of friends, your surrogate family. Musically and creatively it was very satisfying. I can't imagine any other gig I'd be happy doing 6 shows per week for 6 years and still not be tired of it. That's partly due to the genius of Luke and Steve, (Stomp's creators) and partly due to intensity of the show itself. It's mentally and physically very demanding. Although it kept me very fit, I sustained injuries that began to get worse and worse as time went on. Spinal injury in my upper back/neck is what eventually made it necessary for me to leave the show. I actually lasted the longest out of the six others who were hired with me. Claes: Who else are you playing with on a regular basis? 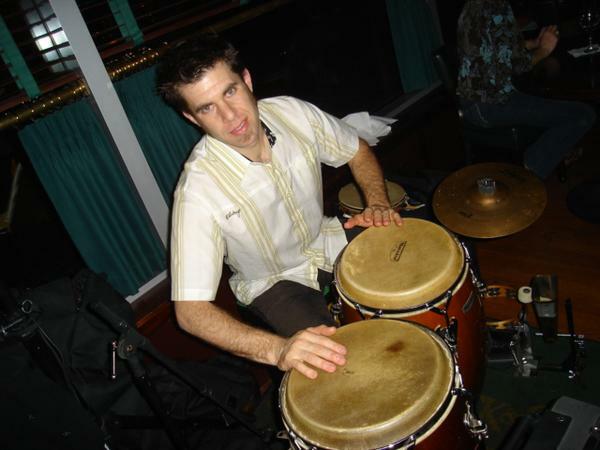 Mosgofian: I play Cuban/Colombian/Latin American music with several bands and artists around town including Angel Ibañez, Felipe "Tiburon" Borrero, Kiko Villamizar, O+ Positivo, Ritmo 3, and Paul Matthews. I play drumset with Atash when their main guy Jason is out on the road with Billy Joe Shaver, I’m the musical director and lead djembe player of Lannaya West African Dance company and I play djembe and dunun with Drum Cafe, an interactive team building event that's very popular worldwide. I also play caixa, repinique, tamborim, and timbal with the Austin Samba School, Academicos da Opera. I've also helped arrange, compose, and direct parts of their shows. Claes: Kurt, you’ve got a degree in classical guitar from the Chicago College of Performing Arts. Previous to that you played jazz in Kansas City. How’d you end up landing in Austin a decade ago? Phillips: I’m a native Texan and after I finished my degree in Chicago I wanted to put down roots somewhere. Austin was on my short list and after visiting and meeting some musicians in town it was a no-brainer. Austin has turned out great. It really feels like home. Claes: You also own Lone Star School of Music. When and how did the idea of starting a music school in the “Live Music Capital of the World” happen? Phillips: Lone Star School of music grew out of me teaching out of my house and at other music schools in town. I wanted to teach at a place that lived up to Austin’s reputation around the country and the world. This city takes its music very seriously but also has a LOT of fun with it. That’s what we try to do at Lone Star. I take teaching to be a great responsibility but I love it and I can’t think of anything I’d rather be doing right now. Claes: TRES’ music draws obvious comparisons to that of Gypsy Kings and Tito Puente. Who are some artists in Latin jazz that are less known that we should know about? Mosgofian: Arsenio Rodriguez, one of the founding fathers of what eventually became known as "Salsa". Eddie Palmieri, just a great influential Nuyorican pianist. Cesar "
What three local bands (any genre) do you think everyone should know? Rosch: TRES, TRES, and TRES. Just kidding. People need to hear Karl Morgan, people need to see Roxy Roca, and people need to dance to Wino Vino. Mosgofian: I’d like to throw a nod to the Austin Samba School. What are your favorite three venues to play in town? Rosch: I like Saxon Pub, the Parrish, and any place that will hire us. Mosgofian: For sound: Venue 222. For funky vibe, Ruta Maya. For the crowd, Stubb's. If you could have a dream-gig, which three bands would play on the bill with TRES? Rosch: This is an impossible question. But I’ll try. How about the Beatles, Beethoven, and Motley Crue. No wait... Prince, Willie Nelson, and Celtic Woman. Maybe, Peter Gabriel, The Galactic Cowboys, and 311. 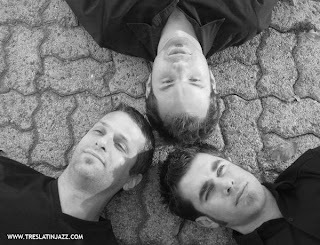 Mosgofian: They would have to play something other than Latin Jazz, so we could draw a decent crowd. Since it's a dream, how about a Police reunion tour with Mozart and Bob Marley?